We are running a bit late on the announcement of the winner of Amy Bearce's fabulous MG book, Fairy Keeper. Thanks again to all those who entered! The winner has been chosen at random and is…. Linda H.! Writers and illustrators living in the Stuttgart area have started meeting on a regular basis. It's not easy to find a meeting point that suits everybody but we have finally found one, the new library in Stuttgart. The library is very easy to get to from the main station, it's a short walk or one stop on the U Bahn. We also saw free bicycle carriages that take you from the station to the shopping centre next door to the library. If coming by car there is plenty of parking. On Saturday we headed to the children's section where we worked on our own individual projects as well as critiquing and reading each others' work, browsing the stacks and discussing all things writing. Discussions included #PitMad and #MSWL on Twitter, where we can find information about writing contests and submitting to children's magazines such as Highlights. Time to concentrate on our own work and sharing information was useful as was the feedback that we received on our work. It really was up to each person to choose what they wanted to get out of the session. The library did get busier and noisier as the morning wore on but there are quiet rooms where you can also work away from any disturbance. After a couple of hours work we had lunch at a fantastic Asian restaurant, GinYuu, which is in the new shopping centre next door to the library. Then several of us went shopping! I personally enjoyed the opportunity to write in a different location and found feedback from others on my work really helpful and useful. On this occasion we were all writers, mostly picture book, but it would be lovely to be joined by some illustrators next time. If you would prefer to just join us for lunch at 12.30pm that would be fine too. Our next meeting will be on May 16th at 10.30 am. 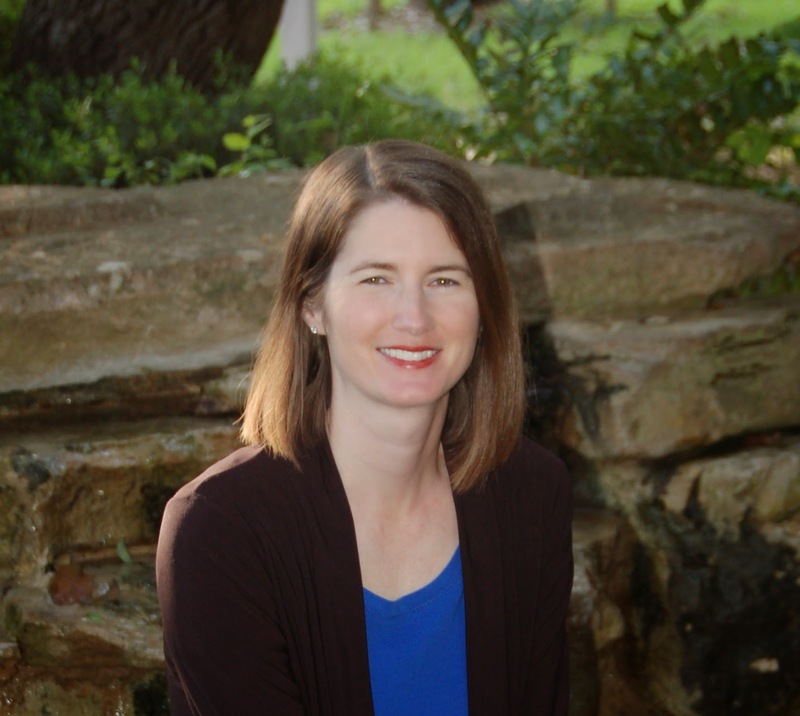 Today we welcome debut author and new Germany & Austria SCBWI member, Amy Bearce to the blog! 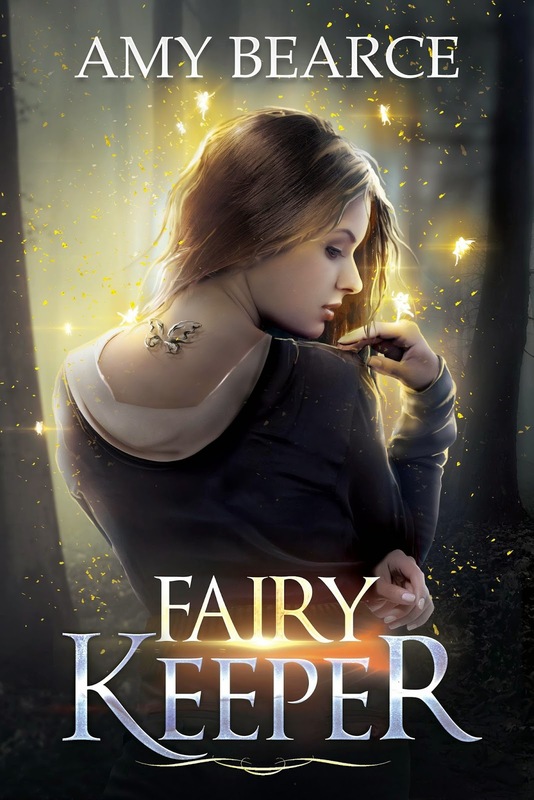 Her book FAIRY KEEPER (Curiosity Quills Press) was just released on March 5th. Welcome Amy! First, tell us a little about yourself. Where you are from, how you started writing, and how long you've been writing with the goal of being published? I’m sort of from Texas. My dad was military, so we moved a lot, but until this year, we had lived in Texas since 1992. I actually graduated from Patch High School in Stuttgart, Germany, in 1992. Now we’re at Ramstein, Germany—and I’m married to the same guy I was dating then. ;) It’s a funny world. I loved writing even in elementary school, but didn’t start really writing outside of class assignments until I was in my late 20’s. I began writing short stories and articles for state testing companies like Harcourt and Pearson. After several years of doing that on a part-time, freelance basis, I read The Artist’s Way and decided, hey, why don’t I try writing something for ME? There are a lot of limits on what you can write for standardized tests and I have always loved fantasy and science fiction. So I began writing an urban fantasy. I joined SCBWI in 2008 when I got serious about wanting to be published one day. I began attending conferences and submitting for critiques. My book FAIRY KEEPER is the fifth manuscript I’ve completed and the first one to be published. Five completed manuscripts! Good thing you persevered. So tell us a bit about FAIRY KEEPER. What was it about this story that drew you in and kept you writing? I wrote a short story based on the idea of Colony Collapse Disorder. A girl was supposed to be the caretaker of the bees for their tribe, but the bees had all unexpectedly died. Then I wondered, what if she was taking care of little fairies that functioned sort of like bees, making magic the way bees make honey, and the same thing happened to them? What if the queen fairies suddenly… disappeared? I liked the idea of this broken, depleted world and how Sierra interacted with the fairies. I’m always drawn to stories in which people who want to heal the world must first heal themselves, and that’s what this story became as I kept writing. That’s a really cool theme. And I love how it started out as an environmental issue that warped its way into fantasy. Fantasy for the win! A lot of our members, including myself, are aspiring authors and find the process of writing books interesting. Could you share some of your process for writing this book? Are you a plotter or a pantser? How long did you need to create a first draft? How long was your revision process? I so much wanted to be a pantster. Madeline L’Engle wrote that way. Stephen King writes that way. But the first three manuscripts I completed as a pantster all had giant holes in them, the kind you could drive a truck through. It just didn’t work for me. I got tired of working for months on something that didn’t work at the end. So I started planning. I read all of Alexandra Solokoff’s blog about screenwriting tricks for writers (very helpful for plotters) and read Save the Cat and a bunch of posts on the sticky-note/notecard method. It made sense to me. These days, I sketch out a rough idea of the whole story before I really start. I might write one scene to see if I like the character or the idea, but then I wait and try to roughly determine what the main events are going to be in the story and how it will end. Those might all change as I write, but I need a destination to keep pushing through a story. I use sticky notes to block out the three-act structure and write a short synopsis that I refer to as I write. Once I have the big picture, I can break down the story into scenes and write one scene at a time. I do a lot of revisions because I layer in details slowly. It took me a while to finish Fairy Keeper, about a year, total. I got distracted with another story idea mid-way through, so I set it aside and worked on the other one for a year. I only finished Fairy Keeper because my critique partner kept bugging me about it. (So thank you, Carol Pavliska!) I spent another six months revising before submitting. The revision process with my publisher was long, but that’s for another question! With my current WIP, I began drafting in April, then we moved in June and I didn’t pick that story back up until October. I finished my rough draft on December 31st. Now I’m revising. So I’ve gotten a lot faster. There’s less floundering around in the beginning, since I know which approach works best for me. I love SAVE THE CAT! A must read for all writers. And now on to the goodies. :-) Do you have an agent? If so, please share your querying experience, any revision you did for them and the submission process. If not, then please share how you submitted to Curiosity Quills Press, how long it took and what it was like revising with an editor. I don’t have an agent, but I’m going to be querying some soon with my next manuscript. I have a dream list of agents I’d love to sign with. I think agents are a very good idea, especially for people who write for children and teens. I have always wanted to work with an agent--this submission to Curiosity Quills just sort of came up unexpectedly. I realize that sounds strange. Curiosity Quills and I actually connected through #PitMad, a Twitter contest organized by Brenda Drake. The thing was, I hadn’t actually entered the contest in which my tweet was found. The year before, I had entered #PitMad with another manuscript I had written. When acquiring editor Lisa Gus went looking for #MG on #PitMad, my entry from the last year was still in the list of tweets, because people were using the same hashtags. She asked to see a query if it was still available, which it was. She loved it, but couldn’t make an offer on that one because they had another title that was too similar. But she asked if I had anything else to show her. I had finally finished Fairy Keeper, so I sent that. She offered a contract and I was thrilled to sign on with them. It was not long from when she first requested my manuscript until she offered the contract—I want to say maybe a couple of weeks? I don’t remember exactly, but I know it felt like a whirlwind at the time. Revising with an editor was great, but more work than I expected. A lot of that work was because we opted to tweak the story from a YA in first person present to an upper-MG in third person past. That meant every single line had multiple changes. These were GOOD changes and I’m so glad we did it, but, wow, it took a long time. And my husband I were preparing for our overseas move and I was finishing my internship for library school… the first round of edits were killer. But my editor, Krystal Wade, really helped refine my story and bring out the best version of it. There were three rounds of edits, in total, and then the proofreading round. Then there was the review of the galley, in which I still found a few edits to make. I signed my contract on April 7, 2014, and my book was released March 5, 2015. That’s really pretty fast for the publishing world! Wow, what a serendipitous way to find your publisher. And Yay for #PitMad. It goes to show that taking chances and getting yourself out there really works. Maybe not when you expected, but…. You now live overseas while your book is being published in the US. Has that been a challenge in this whole process and if so how? Yes, living overseas right now has definitely added a challenge to the whole process. Shipping overseas is expensive and time-consuming, and a lot of companies won’t ship to APO AE addresses at all, especially for promotional items like banners or bookmarks. Shipping to a German address from the states has its own complications and additional costs. So I’ve had to send a lot of things to my parents and have them send them to me. Even getting my books here has taken more time than expected. And of course, because I’m still pretty new here, most of my support base is still in Texas. Celebrating my book with my friends and family at home would have been really lovely, but they have been a great support to me through social media. I’m so thankful for all the ways we can keep in touch online. I’ve also met lots of new friends who are excited for me, too, (like you, Patti!) and I value those new friendships. The process of working with Curiosity Quills while living in Germany hasn’t been a problem at all. I’m not their only author working outside the United States. One of their marketing folks is in the UK, so she usually answers my emails first thing in the morning while everyone back home is still asleep. CQ has been very supportive and has worked hard to figure out the best way to deal with the overseas situation. Those are very good points about companies not shipping to APO AE addresses. But I’m glad things have worked out. And finally, please share with us what's next. What are you working on? I’m currently revising a companion novel to Fairy Keeper called Mer-Charmer that is focused on Sierra’s younger sister Phoebe and the merfolk. It’s been a lot of fun to write, especially since a lot of it takes place under the water. It’s set four years later, so you’ll get to see how Sierra’s doing, but the story is very much about Phoebe, who is now 14. I also completed a draft of a YA urban fantasy that I’ve wanted to write for a long time, and it’s in very rough shape right now. It’s on the back burner until I get Mer-Charmer ready to submit. I’m hoping that will be in the next month! One lucky winner will be chosen randomly and announced on March 20, 2015. Good luck everyone! Amy is also hosting a Goodreads Giveaway. You can reach Amy via her blog, Facebook or Twitter. Laurel Decher and Jane Joo Park report from the NorthRhine Westfalia Scrawl Crawl. The first stop in our state-wide meet-up was Düsseldorf. 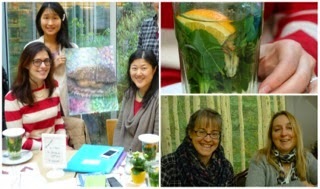 Five writers and illustrators sipped ginger-peppermint-orange tea next to an indoor waterfall and talked shop. The café of the Stern Verlag bookstore was a great setting for sharing work and discussing how we might work together. • Writing more, better, faster. We haven’t yet picked the next stop on the NRW Scrawl Crawl. We’re all interested in a sketching and scribbling visit to Bonn’s natural history museum, Museum Koenig, and the Bilderbuchmuseum [Picture Book Museum] in nearby Troisdorf. Writing & Illustrating blog. Both Laurel and I subscribe to this blog. There are many great blogs relevant to our industry out there, but since I only have time to really follow one, I've chosen this one. Catherine Friess' is an SCBWI member. On her blog she reviews and recommends picture books. This is the book that Laurel brought along for writing prompts. It is also a good source for inspiration. More about THE BOOK, an SCBWI member benefit. THE BOOK includes info on contracts and how to submit work for publication for writers or illustrators. Another great resource is Writer's Digest if want to learn about getting published, are actively submitting, and want to publicize your work. Organisation which promotes startups. They offer workshops on taxes and insurance in Germany for the freelancer. The natural history museum in Bonn has an African savannah exhibit. A rainforest exhibit is planned for 2016. The picture book museum in Troisdorf. There are only 2 or 3 picture book museums in the world. Want the NRW Scrawl Crawl to come to a city near you? Let us know and we’ll keep in touch!